The deal Syriza are looking for is a reasonable one. For their creditors to forgive 50% of their debts, for debt repayments to only have to be made once the Greek economy is growing again, for the EU to stop privatising Greek government assets and services by selling them off for buttons at the bottom of the market, and an end to austerity policies which prevent growth (1). This is a plan based on the 1953 London Agreement under which Germany was forgiven 50% of its debts incurred during two world wars and from Marshall Plan aid from the US after them. The creditors forgiving half of those debts included the governments of Greece, Ireland and Spain, three of the four countries much derided as ‘PIGS’ over the debt crisis. The London Agreement also included Germany only having to pay back debts out of 3% of its export earnings, so that its creditors imported German products (2). While saying there will be no more debt reductions for Greece, Angela Merkel and other EU government leaders have approved issuing 1.1 trillion (one thousand one hundred billion) euros of “quantitative easing” money to be handed straight to private banks (3). How is it that there is infinite money available to the banks, but none to keep ordinary people in work? Or even on benefits while there are more unemployed people than job vacancies? Syriza’s proposal is that some of the QE money should be used by the European Central Bank to buy bonds not just from private banks, but from governments suffering debt crises, like Greece and Spain’s. Some Greek and American economists are saying the only problem with Syriza’s proposals are that they’re not radical enough (5) – (6). While many have tried to paint Syriza as being left wing extremists, mirroring the neo-nazi Golden Dawn party’s right wing extremism, in fact Syriza’s leadership are moderate left wingers. Even the Telegraph newspaper, which favours the right wing of a Conservative party whose centre is right of Thatcher, considers Yanis Varoufakis, Syriza’s Finance Minister, to be a moderate (7). Far from being ideologically opposed to EU or Euro membership, Syriza leader Alexis Tspiras preferred a coalition with the right wing but anti-austerity Independent Greeks party to one with the radical left KKE party which wants to leave the Euro and the EU (8). Other studies found that Greeks work on average 38 hours a week, compared to 35 in the UK and Germany (11). And Germans take more days of holidays per year than Greeks too (12). 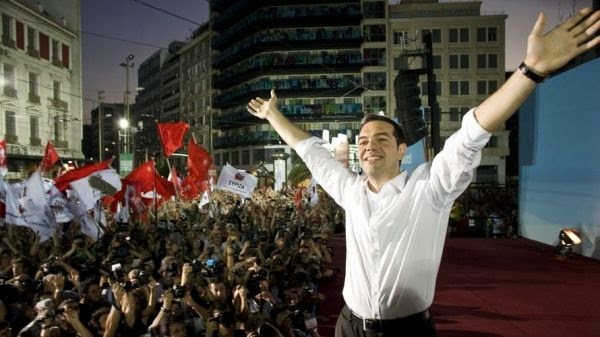 Greece allowed more tax avoidance and corruption? Tax avoidance by Greeks is also often raised to try to justify the conditions imposed by the EU. Tax avoidance is certainly a serious problem in Greece, but the idea that other EU countries have done anything to prevent it is laughable. The UK allows offshore ones in the Channel Islands and in the UK dependencies of Bermuda and Belize, as well as the main party in government in the UK getting more than half its donations to party funds from the financial sector. Both Luxembourg and Switzerland are renowned tax havens. It’s highly likely that much of the tax money avoided by wealthier Greeks is in those tax havens in other EU countries and territories they control. Since they’re demanding a crack down on tax avoidance and evasion by the Greek government, perhaps they could help out at the other end by closing down their own tax havens? Mark Field, the Conservative MP for the City of London & Westminster, Mark Field, boasted in 2010 about all the foreign money coming into UK tax havens (13). Government minister Francis Maude said in 2012 that turning the UK into a tax haven is “exactly what we are trying to do” (14). Lord Fink, Treasurer of the Conservative party, and director of three firms with subsidiaries in tax havens (the Cayman Island,s Luxembourg and Guernsey) called for the same (15). And progress has been made towards making the mainland UK a tax haven, with many US firms now relocating their headquarters for tax purposes here (16). Ireland’s economic “miracle” and then collapse were, like Britain’s , largely down to deregulation (though worse for Ireland as it didn’t have it’s own currency). This included Ireland slashing its corporation taxes to the lowest in Europe in order to get companies to relocate there for tax purposes (17). That’s why Ireland was able to recover relatively fast from the crisis. But, as Greek government ministers point out, there is not room for every country in the EU to have the lowest taxes, and competition to reduce taxes results in crises for government funding in all of them. As the firms and banks benefiting most from tax havens also tend to be big donors to party funds for the biggest parties in countries across the EU, corruption is as much a problem in the UK as in Greece, it’s just done in a more formalised way and at a higher level in Britain. Cash in brown envelopes is for amateurs. Donations to party funds, and jobs as advisers or directors for retiring ministers for favours done in office, are preferred. Does Greece have any choice but to do what the EU and Germany say? Yes. It could drop the Euro as a currency and return to the drachma, or adopt another currency, such as the dollar. This would likely cause another crisis and considerable hardship, but with the austerity imposed by the EU having seen average incomes cut 40% and unemployment over 25%, most Greeks are already suffering plenty of hardship and might decide that having control of their own government and economic and welfare policy and budgets again was worth a bit more. This would likely lead to a run on the Euro, which might well lead to Portugal, Spain and maybe even Italy also dropping the Euro as currencies. The Eurozone benefits Germany most of all. Countries leaving the Eurozone would reduce German export earnings, which have been greatly increased by the Eurozone effectively reducing the price of German exports in countries using the Euro (18).